I have been thinking about creating a blog, not for my Media classes or English classes but for me; about me; my thoughts on education, media and technology. A place where I can wax lyrical on the joys of my job, the love I have for learning and the path that I am forging – seven years into my career as a “21st century educator”. What finally tipped me over the edge? My new iPod touch! Having finally bought one after clinging to my iPod classic for some time now made me think that I need to set-up this blog and jump right in. The simple fact of the matter is this, the iPod touch is like all good learning, in that to really get to grips with it you simply need to download some apps and experiment; see what works and what doesn’t. I have decided to approach this blog in the same way! For a while, it will go one way, then another (changing themes, adding/removing apps and widgets) but eventually it will find a form, some sense of structure and hopefully a sense of self. Since it was my iPod touch that caused me to be writing this post, I thought I would add some info on the progress I have made in getting to grips with it over the last 48 hours. Below is a picture of the apps that I have already installed on to it. Underneath the picture I have tried to offer some explanation as to the reasoning that went behind my decision to download and install each app. I was a good new iPod user and began by syncing my Google account with the iPod – linking my mail, calendar and contacts. My next priority was to pick a Twitter client. This is a very important decision as Twitter is to me: the most useful and invaluable communication tool since the invention of e-mail. I have been using Tweetdeck on my Macbook Pro for some time now, so I naturally gravitated towards their iPhone/ipod app and I am reasonably satisfied. I did briefly (45 minutes to be exact) try Twitterrific but I really did not like the GUI at all. Next I wanted access to the rest of my Google stuff, I say stuff because I use so many different Google features that I have lost track. I knew that I definitely wanted to be able to access/read/update my tasks, docs, reader and photos, so I installed the Google mobile app for iPhone/iPod. It works, like Google products usually do, beautifully. With the most important features sorted yesterday, I spent today focussing on the other things that would make my use of the iPod touch the experience I hoped it would be. I knew that I would want to be able to store, read and transfer files. This is quite important for me as an educator and life-long learner. Having gotten a £15 iTunes gift card free when I purchased my iPod touch I was prepared to pay for the right app. I went for Files in the end, the GUI is simple but clean and the process of copying files on a Mac is simple and clean also. I went for the pro version as I did not want adverts and I also wanted plenty of storage capacity. Next I installed the pro version of Instapaper as I use this almost as much as I use Google reader. I read a lot! And I don’t always have time to read an entire article right at the moment when I find it. Furthermore, I spend a lot of time in front of the screen so I wanted to be able to take stuff away and read it at my leisure – able to take breaks when I want to help with my eyesight/headaches and I also wanted to be able to read offline. Instapaper for the iPhone/iPod touch does of all of this with ease. Installing this app also led me to learn more about the functionality of the iPod touch; learning to install “bookmarklets” into Safari in order for me to be able to copy web pages to Instapaper from with the iPod touch’s web browser. I used the same process to add a bookmarklet that allows me to save web pages to my delicious bookmarks as well. 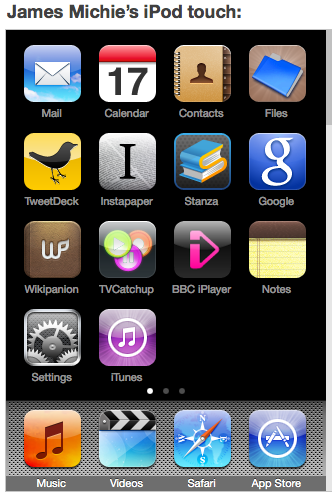 After I had added and set-up those apps I set about looking for and adding some apps that are simply for my pleasure. I added BBC iPlayer as I was extremely impressed by the pixel quality of the video, streaming it on the iPod touch. Then thanks to Doug Belshaw (more about Doug further down in this post) and his post here (very timely indeed! ), I added TVcatchup which allows you to stream live British TV including BBC 1, Channel 4, E4 and Channel 5 amongst others – the quality is again awesome over a wifi connection. Finally I two apps that reflect my thirstfor knowledge. I added Stanza so that I could download and read books. I found it after looking for apps to read pdfs on. And I added Wikipanion so that I could search Wikipedia in a more user friendly way than through Safari which on the iPod is not bad but does have its limitations. Come on Google, I want Google chrome for the iPod touch and I want it now! There, I hope that was neither too painful or too boring. It was a little self-efacing but hey this blog is about me so I’m not going to appoogise too much. Before signing off I need to say thanks to Doug Belshaw for some sage like advice. As I am want to do nowadays, I consult before I do and I have admired Doug’s blog for some time now – he answered my questions with interest and honesty. For this I am grateful. He is always the provider of excellent ideas and useful information, his blog is well worth following! You can also buy or download for free a really useful book that he, I and many other members of our Twitter network collaborated on called “#movemeon”. The original blog post suggesting the idea is here! Well that is all then, I’m off. I may not blog every day but when I do I intend it to be with purpose and hope that others find it interesting and useful. I have played with it in the past and liked the web/desktop interface but never really understood the benefit – between Google reader, Instapaper, Google docs and e-mail I found it just an additional application I had to keep up with. It does seem to be very popular though, so maybe I am missing the point. I would be interested to hear how you and others use it. What are the benefits? Nice start.You'll need a blogging app for the Ipod as well. btw, this blogging thing gets a bit addictive. I started recently and it is now a vital part of my PLN. Thanks! Yes, I enjoyed writing it, more so than my school blog even though that has been very enjoyable at times. It was nice to get a little more personal. I already have post number two in the works – will hopefully publish later today. Next Next post: A Very British Education.